Oil on canvas, 41 1/8 × 29 in. As we approach the Christmas season, nativity scenes abound on holiday cards and advertisements. Whether true believer or determined skeptic of the Christian narrative, an excursion to LACMA is nothing if not timely. 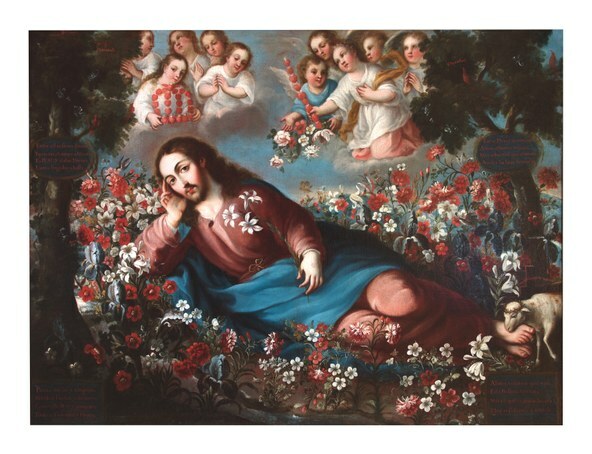 Painted in Mexico, 1700-1790: Pinxit Mexici presents a great number of 18th-century canvases that exemplify the ways Christianity was promulgated by Catholic rulers in the New Spain colonies. The exhibition is an unprecedented assessment of painting by artists influenced by European training and history yet often venturing into alternative visual territory. Oil on canvas, 42 1/2 × 58 1/16 in. That alternative is one of the most captivating aspects of this presentation. Familiar genres and religious figures are painted in truly startling ways. 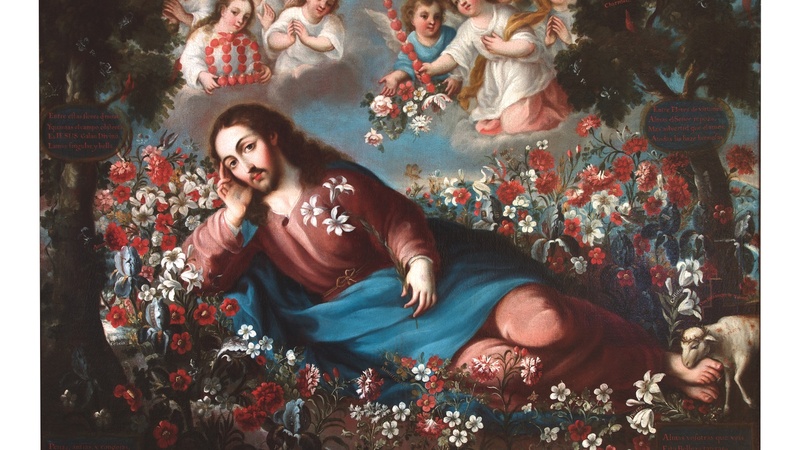 For example, The Divine Spouse painted around 1750 by Miguel Cabrera, presents the figure of Jesus Christ lounging on a bed of flowers with a comehither expression. 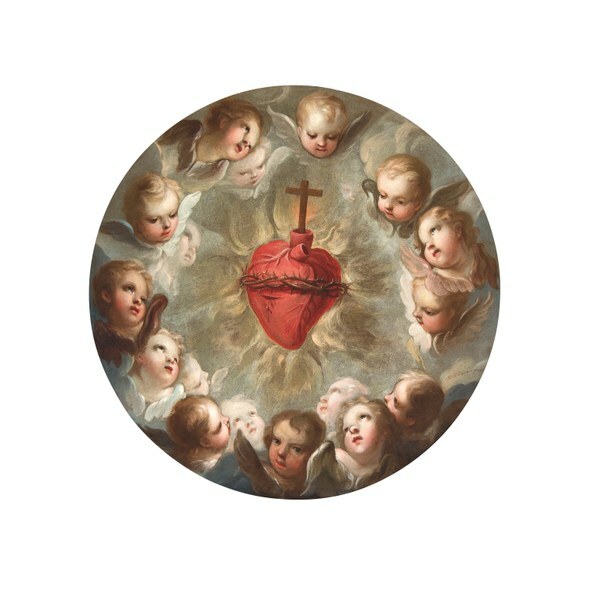 This divine spouse to cloistered nuns is offered with a languid, unnerving sensuality. Oil on canvas, 74 13/16 × 45 11/16 in. Some 100 paintings are based on themes recognizable from long histories of Old Master or Renaissance art but the most revelatory have a slightly skewed orientation. By the 18th century, Spanish had ruled in Central and South America for two hundred years. Generations had imported or absorbed what were seen to be the refinements of European taste. 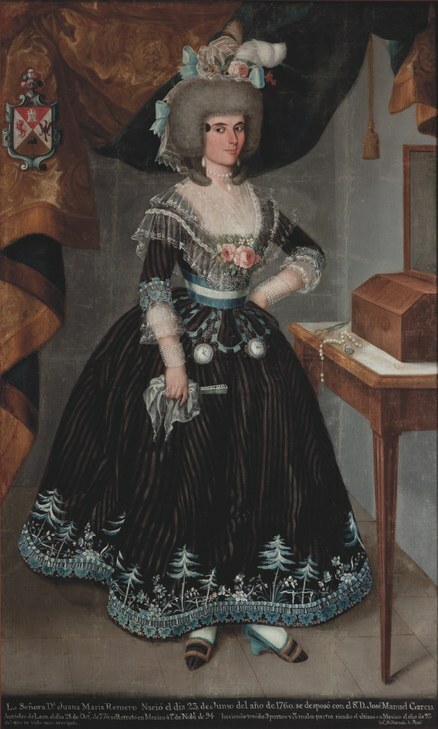 Academies were established to train aspiring artists, such as the Royal Academy of San Carlos in Mexico City, the capital of New Spain. Towards the end of the 18th century, standards were higher and the quality of execution more in keeping with the highly trained artists of the European capitals. Yet, the really fascinating part of this show comes from the idiosyncratic interpretations fostered by varied Catholic institutions throughout Mexico. Aesthetic liberties and motifs from the sophisticated indigenous cultures that preceded the Spaniards energized a traditional regurgitation of European art history. Oil on canvas, 64 9/16 × 35 13/16 in. Organized by LACMA’s Ilona Katzew, along with a host of other curators, the show is arranged according to broad categories, including the fascinating Casta paintings, a field in which she is a reigning expert. These pictures were produced as documents of purported heritage and genetics. They portray interracial relationships such as a well-born, light-skinned Spainiard with a mulatto woman and their unexpected albino progeny. 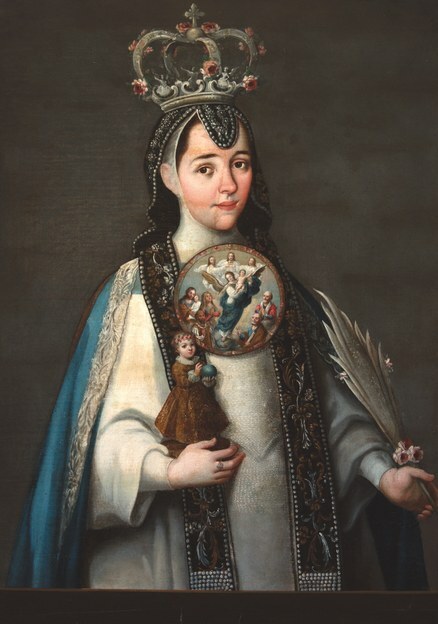 This particular painting by Miguel Cabrera, who is considered one of the most exceptional artists of the era, is exactingly titled: From Spaniard and Morisca, Albino Girl (1763). Such pictures made sense to 18th-century viewers, especially to aspirational gentry of the colonies, even as they seem bizarre and even offensive to a contemporary eye. Oil on copper, diameter: 16 3/4 in. 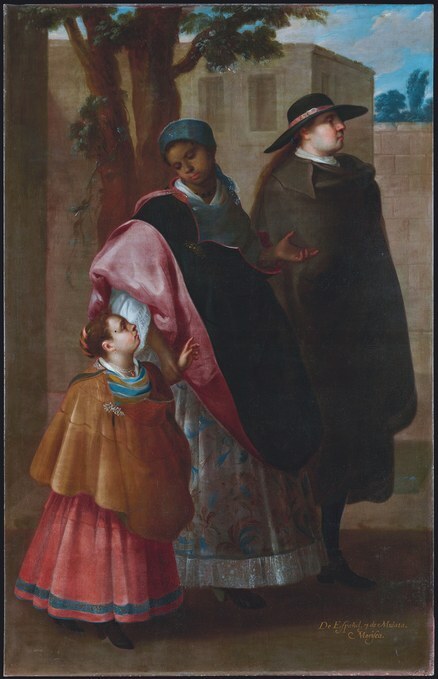 Christopher Knight’s thrilling story on a mysterious missing Casta painting can be read here. There are further revelations throughout this show, which was co-organized with Fomento Cultural Banamex, A.C. in Mexico City. Though a worthy companion to Christmas celebrations, it remains on view through March 18, 2018.